The story below is copied in its entirety from SunnySkyz.com, a site that posts positive news for a change. Try not to tear up – I dare you! Joey Mustain took his daughter Stella on a regular Daddy-daughter date to their local Chick-fil-A on Monday. But they walked away from the experience with something more than just a chicken sandwich and those famous fries. “I took Stella to Chick-fil-A today. It’s our normal daddy/daughter spot. It’s clean, so good, and the playground has a tractor beam on her the moment she sees it. When we finished eating and she’d worked up her dessert appetite playing with the other kids, we went back to trade in her toy for ice cream. She wanted to sit at a table to eat the cone (something we usually do in the truck), and I’m so glad she did. We took a booth right next to the spot where you wait for your drink to be “refreshed,” and we had a front row seat to this beautiful scene: a homeless traveler had walked in and asked if they had any extra food. Mud was wet and caked on his well-traveled shoes. His hair was matted, and his beard wasn’t a statement as much as it was a necessity and a sign that he doesn’t get to shave as often as most of us do. People near him kept their distance, but that didn’t stop him from being kind. He spoke to people who reluctantly spoke back, and he smiled while he waited on a manager. 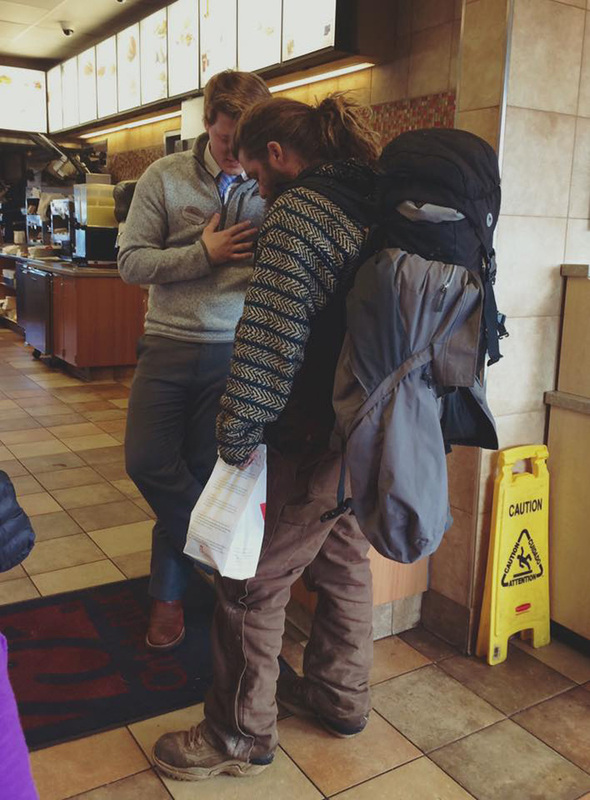 All I could pick up on of the conversation was the manager saying that he’d love to give him a full, warm meal–not just scraps or extras–, and the only thing he required was that the man let him pray with him. The homeless man wasn’t some untouchable stain on business. He was the reason that store opened its doors this morning (or any morning). I asked Stella to watch and she stared. She asked what was happening and when I told her, she bowed her head, too. I realized then and there that Chick-fil-A doesn’t simply do business for profits, they truly use business to minister.